A learning management system (LMS) should support every aspect of your district’s digital infrastructure. How do you choose an LMS that will best fit the unique needs of your school or district? Find out what these educators have to say about why they chose their LMS and how it’s working in their context. 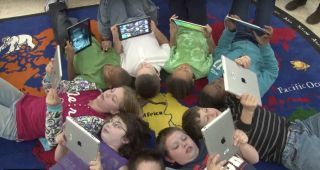 Students at Evansville Vanderburgh School Corporation on their iPads. What they love about their LMS: Tim Wilhelmus, innovation, curriculum, and technology specialist, says itslearning serves as a centralized hub and digital playground for teachers and students. The platform offers Google integration and its flexible architecture allows teachers to bring in “outside” Web tools and other functionalities, thus expanding the LMS and letting it “live outside of the itslearning space.” Wilhelmus particularly likes itslearning’s planner and pages features. The fact that it can be used with primary grades is also important for this K–12 district. A kindergarten classroom at DSBN incorporates Brightspace from D2L into their classroom activities. This Springfield Public Schools high-school student dropped out earlier this year, but he’s on track to graduate in May—thanks in part to weekly meetings with blended learning specialist Jeremy Sullivan. What they love about their LMS: In a pilot, Springfield students unanimously chose Canvas for its clean design, mobile device capability, and user interface. “Canvas is so easy, even our teachers can use it!” one student quipped. The district uses Canvas for everything from their online school, Launch, to credit recovery, curriculum, digital libraries, professional development, and student courses. “Canvas is one simple package with all the tools and resources that a teacher needs. It’s an all-in-one, out-of-the-box solution,” says director for blended learning Dr. Nichole Lemmon. An elementary student at Greater Essex County District School Board engages in a number-learning activity. Anne Pasco, Director of Digital Literacy and Innovation at Community School District 300. What they love about their LMS: “By creating an onboarding curriculum to orient students to the Chromebook and Google apps as well as systems for obtaining support, we were able to have students fully engaged in PowerSchool learning activities such as discussions, polls, and formative assessments during the second week of school,” says director of digital literacy and innovation Anne Pasco. Since they began the rollout in 2016, they’ve seen “an increase in teacher-to-student feedback, differentiated learning activities, student ownership of learning, and collaborative teacher innovation.” Pasco also appreciates PowerSchool’s intuitive interface, ease of use for learning analytics, and focus on K–12 environments. Students at Thunder Bay Junior High School in Alpena Public Schools benefit from online classes through Blackboard Classroom. Science students at Elm Place School in North Shore School District 112 conduct an investigation.